Copper sinks and bath tubs are as visually impressive as they are soothing to the senses. They are unique and elegant, and with constant use, your copper tub will develop its own unique color. Known as a patina, this color develops as part of the natural aging process. It protects the tub from corrosion, naturally creating a stunning pattern of light and dark tones that is unique for every fixture. Aside from the beauty of the material, copper sinks and bath tubs offer the natural healing properties of copper; such as killing the microorganisms that cause mold, algae, fungi & bacteria, which are present in the water and could be harmful to the body. The efficiency of copper bath tubs is also remarkable, as they heat faster and retain heat longer. Highly durable, rust resistant and also incredibly hard to ding or dent, they are also extremely easy to clean and maintain. 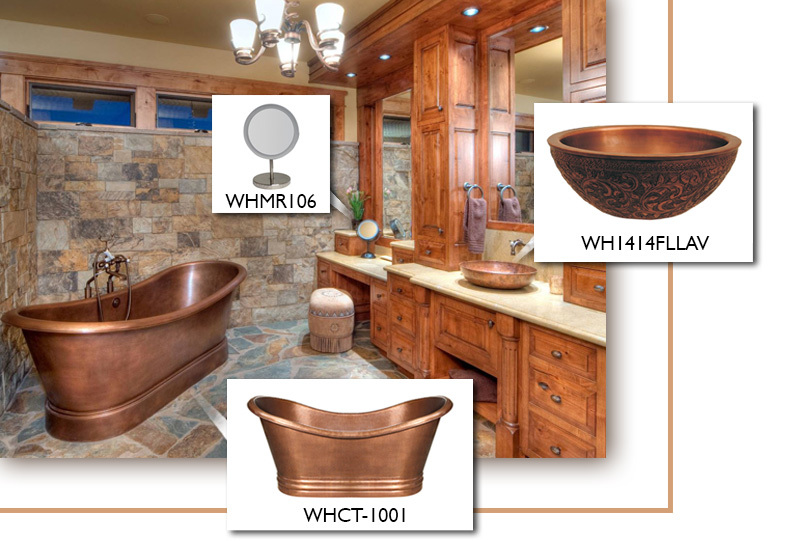 Whitehaus Collection has beautiful options for copper sinks and bath tubs. If you like the look of this Western inspired bathroom, you can achieve it with the suggested products. The clever mix of textures: natural rock on the wall and the slate floors paired with the clear finished wood of the cabinets, centers the attention on the gorgeous presence of the freestanding copper tub. The unique patina of the above mount copper sink is beautifully highlighted by the light colored countertop. The contrasting combination of raw materials make this bathroom as impressive as it is relaxing, taking the natural beauty and benefits of copper to a new level of functionality, natural healing and comfort. Whitehaus Collection® offers many options for bath sinks and tubs to choose from.